A young Harmeet Shah Singh pictured at the wedding of one of his older sisters. New Delhi, India (CNN) -- The school bell rang and along with my sixth-grade friends, I climbed down the stairs. My teenage sister was in the hallway waiting for me. Her being there was unusual. "Indira Gandhi has died," she whispered in Punjabi. Kukki, as we called her, hung my bag on her shoulder, clasped my hand and whisked me out. We jumped onto a cycle rickshaw outside. In about 15 minutes, Kukki had brought me home. It was the afternoon of October 31, 1984. I was 10, but I could sense some unease in the air as strong rumors persisted that then-Prime Minister Gandhi had fallen to the bullets of her Sikh bodyguards. There were no private TV networks in those days in India and confirmation of her death on state-run television and radio came late. By evening, we did hear rumors of some stray attacks on Sikhs, but I don't remember seeing anything on our television about the assaults that night. My parents didn't send me to school the next day. By now, we knew attacks were not sporadic. Ours was the first Sikh home -- and the tallest -- in our lane. Curious, I darted to our roof. I remember seeing plumes of dark smoke rising on the horizon. Sikh properties were on fire in the commercial and industrial belt that ringed our locality in New Delhi. On November 2, our neighborhood, largely Hindu, decided to begin building defenses. A makeshift barricade of bamboo was put up right at the entry to our lane and residents were on night patrol like watchmen for at least the next month. I still remember a night when I heard young boys issuing what would be a false alert about mobs being close -- perhaps to keep everybody awake. It worked. In the first week of November of 1984, we secretly shifted what we regarded as our most expensive belongings to the home of one of our Hindu neighbors. A double-deck tape recorder, which my father had bought from London, was one thing that I carried to the neighboring house. Attacks went on until November 3. Our locality was spared, but in the aftermath my parents would ponder the future. A challenge was how to take me to Punjab, where most of my maternal family lived. Sikhs had been singled out and killed in trains and buses. 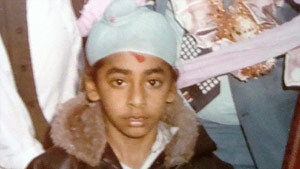 Like other children from the community, I would wear a "patka," a small under-turban or a scarf, as headgear. It was decided my mother would dress me up as a girl. I was unwilling, but my mom told me that was a good safety precaution. I think it was most of December that I spent in Punjab. My father -- maybe many other parents like him -- in New Delhi had already submitted a leave application with my school, a Sikh school. I began feeling terribly homesick in Punjab, so for me perhaps the happiest moment from that time came when I stepped into my home again. When I rejoined my school, a teacher circulated some "chits" to our class, a sacred Sikh verse asking for God's help in difficult times. I remember we all sang it in chorus.